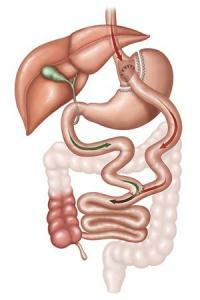 The Roux-en-Y gastric bypass is considered the gold standard of bariatric procedures. It is the most common weight-loss surgery in the United States. The surgeon creates a smaller stomach pouch, then attaches a section of the small intestine directly to the pouch. The smaller stomach causes patients to feel full sooner and eat less food. Bypassing a portion of the small intestine also means that the patient’s body absorbs fewer calories. In addition, bypassing the upper portion of the small intestine results in metabolic effects that lead to dramatic improvements in type 2 diabetes, hypertension and dyslipidemia. For more information or to request a consultation, please call us at 888-717-4463.